Life As Story Blog — Lindsey O'Connor's site. For True Storylovers. Summer is ending and I hate to see it go. My favorite days are ones spent on a lake. Sitting on a dock with my feet in the water and a book in my hand and a boat calling my name…bliss. I've always been intrigued by people who don't just vacation. They "summer." A friend of mine has a large lakefront cabin called Inverness that is a century old and has been in her family since the 1960's, in a town where families have summered for generations. Every summer she invites me and a few friends to join her for several days and I soak up the sun and the smell of the water and watch children in sailing school criss cross the lake. Summer, I will miss you. And I'll hold onto this memory of a perfect day on the water. What will you miss about summer? Have you ever "summered?" The grass is still winter brown now, a shade that leaves me longing to go somewhere afar. Some place that holds promise of a little adventure, or a lot. A place to see and be that expands my view of the world, all shiny with it's newness to me. An experience. What are you dreaming of? And why? Writing regularly makes a blank page welcoming, a call to come and sit down, do what I love. But when I get sidetracked by life, or fear, or failure, or the dreaded “wanting to write” more than I write, I lose my groove. The blank page of a new document or the first page of a new notebook when my groove is —gasp—AWOL is like gripping my toes over the edge of a dock, staring at the cold lake waiting. So I jump. Feel the initial wave of fear, then cold, joints and muscles momentarily stiff, tense with the immersion. Then I move, kick, begin to swim and now I’m no longer on the dock, no longer hesitant, no longer facing a new notebook with one hundred sheets of blank paper, or the blinking curser with unlimited blank pages. Ink fills the page. Words fill the page. It comforts. Tomorrow, the water will be less cold. Smack down the fear of beginning. Say, “it’s just words.” Junk is okay. Get thee to thy desk; derrière in chair summons your groove. Take a book you love and copy a paragraph you particularly like three times. You only use it to warm up. It’s just practicing your scales; getting your fingers moving. An author you love inspires you to write. Jump in. Write a six word sentence. Ignore the cold. Write a longer one. Keep going. Write 250 words (about a page) before checking your email. If the rest of the day is a wash, you will have written a page. Feel the comfort. Remember why you are doing this. You are a writer. Splash about. When you’ve written something, anything, dry off, repeat 1-5 tomorrow. Smile. Tweet this: How to get back your writing groove. What do you do to find your writing groove when you've lost it? The winner of a copy of The Long Awakening is: The Curried Nut. The winner of a copy of my book and the $20 Amazon gift card is: Lori Raines. The winner of a copy of the book and the $20 Starbucks gift card is: Kimberley Stone Wade. Congratulations! Please message me your information to receive your prizes. Thanks to everyone who participated. Be sure to keep an eye out for my next giveaway...coming soon! If you enjoy reading memoir, here are a couple that I love. In an Instantby Lee and Bob Woodruff. In 2006 Bob had just been named co-anchor of ABC's World News Tonight and while embedded with the military in Iraq a nearby explosion caused a traumatic brain injury and nearly killed him. It's not only a fascinating account of this story that made national news, but also of Lee's experience as she dealt with what happened to her husband, because trauma also hits the family of the person traumatized. Eerily, Bob's description of his coma and recovery resonated with my experience, but I love this book because it's a story about courage, and coping, and love. Keeping the Feast by Paula Butturini. A journalist, action, food, and Italy, all in one memoir. I first got an audio copy of this book, a format I enjoy, but after the first two minutes of listening I went out and bought it because the writing was too beautiful not to savor slowly in print. Paula and her husband, John, were both foreign journalists working overseas when John was hit by a sniper's bullet twenty-three days after their marriage. His recovery was far more than physical and one way their family coped was through food. She shopped daily at a market in Italy and served three meals a day around their table, a ritual that was healing, sustaining. This book has rich, layered themes about healing and struggle, love and food. It's a literary memoir that I'm going to read again. What's a memoir you love? 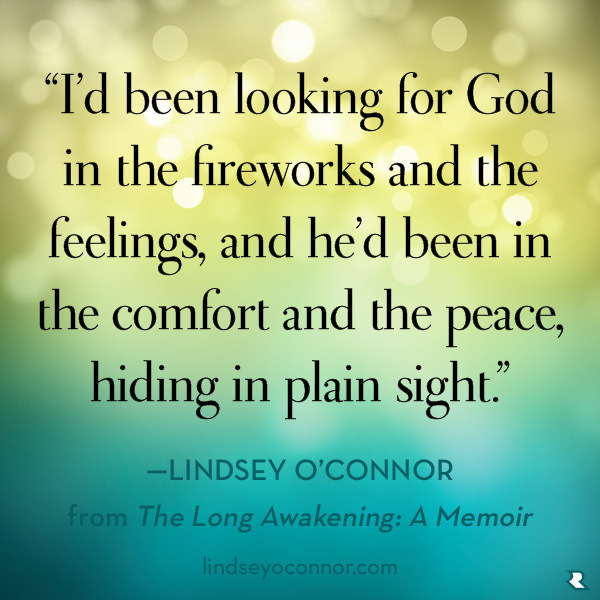 My memoir, The Long Awakening, has hit the shelves! To celebrate, I want to do some giveaways, so keep reading about how to get some great free stuff, but first let me tell you what it's about. You can check out the video below too. This is a true story of waking from a two-month coma after childbirth and struggling to discover what had happened, to love my child, and rediscover who I was. It's a story of lost and found love, the effort to make sense of life-altering events and the search for self-discovery. An altered life and the long journey afterwards can be painful yet beautiful--a poignant lesson on the ambiguity of meaning, the power of love, and purpose when you know who you are. To learn what happened to me and my family during my missing two months, I approached it as I do when reporting a narrative about another person. I used my skills as a journalist to report my own story. A surreal experience indeed. I'm giving away three prizes this week. An autographed hardback copy of The Long Awakening. A $20 Starbucks card and a hardback copy of The Long Awakening. A $20 Amazon gift card and a hardback copy of The Long Awakening. a link to this post on Facebook or Twitter, with the hashtag #LongAwakening. Do this next thing in addition to the above two and you get two entries. 3. Be sure to "like" my new Facebook page and say hi in the comments. Enter by Friday, Oct. 4th. I really want to be me. Which shouldn’t be complicated in the least, except it is. Or rather, the true expression of being myself is a little tricky these days, and I think it’s social media’s fault. Authenticity, living out and revealing who we really are, requires a combo of vulnerability and a certain degree of restraint. Even thinking that feels at first a little inauthentic. If I’m being authentic, I don’t have to think about it, I’m just me, right? I have A.) the person I am right now, and B.) the possibility of the person I’m becoming as I grow and learn. I want to be introspective enough to get from A to B without being solipsistic. And I have to be just the right amount of transparent, revealing the appropriate amount of myself in the right forum to the right people— soul baring with my husband, transparent with friends, real publicly, but not sharing TMI with people who don’t need or want to know too much. I’ve grown really comfortable in my skin. It gets easier with age, but it’s also my natural bent. Someone in high school once told me, “You are too transparent.” It shocked me. I thought everyone was like this. I was embarrassed and held back for a bit, but that didn’t stick. Then society began changing. People gradually shifted to wanting more openness, not less. Now, a generation later, our society no longer holds the voice of authority as the standard, but has shifted to valuing authenticity. Author and speaker Brene Brown has created an authenticity movement on her blog Ordinary Courage. She said, “In the song Hallelujah, Leonard Cohen writes, "Love is not a victory march, it’s a cold and broken hallelujah." “Love is a form of vulnerability and if you replace the word love with vulnerability in that line, it's just as true. If we always expect to feel victorious after being vulnerable, we will be disappointed.” As Brene says, it takes courage to be vulnerable. So we call on our courage to be real, show our authentic selves, and reveal our soft spots, holding back TMI while embracing the cultural acceptance and desire for authenticity, even in moments when we’re scared to death of doing so. Offer content. Be useful. Consider your tribe. Find your voice. Withhold oversharing. Be transparent. Being "me" has never been so hard. But in the end, who else can we be? Neither social media nor cultural changes nor non-victorious vulnerability can change the real me. Broken hallelujah and all. What I did today: read, worshipped, worked on training Finley—our new puppy—took her on her first long hike in the CO foothills, helped my girl get her phone fixed, grilled steaks. It was a long, rich sabbath. Mainly because God reminded me twice today to praise during difficult times. What have you created lately? Or are planning on creating? Share in the comments because creating is hard and we need to cheer each other on. And I really want to know what you’re making. I’m cooking up something with audio—my favorite. Books are my favorite too, both good. Both favorites. 😆 If I could give you a little gift with audio—a story or a how-to or some inspiration in our days that are sometimes rough—what do you need lately?